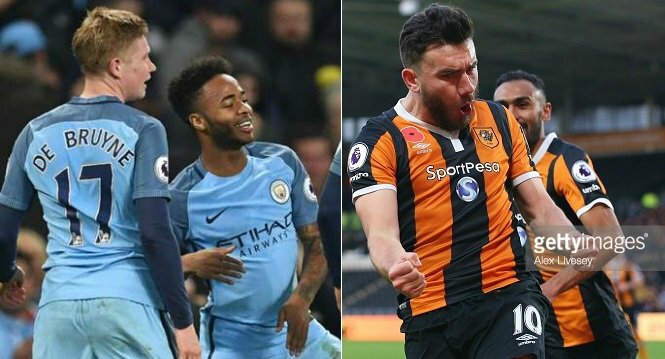 Manchester City are set to take on Hull City in premier league game on Saturday, 08 April 2017 at Etihad Stadium in Manchester. City needs three points to keep themselves in a hunt for champions league places while Hull City will be confident having moved out of relegation zone for the first time this season but they do need something out of this game to keep their survival hopes alive which makes it a massive game for them. This will be the second times these two are meeting this season, Manchester City produced a superb 4-1 win over Hull in the EFL Cup quarter final back in at the start of december. Hull City are a decent team and two of their three wins came at home. Mike Phelan has struggled to put together results since taking over the team as full time manager but he will be eager to get something out of this match. City will be hoping to build on their 2-1 win over Arsenal and get back into the title race. Team News & Lineups: Manchester City will have Fernandinho back in the starting lineup after his suspension is over while Sergio Aguero is still missing and will sit out his last of 4 games suspension. However Zabaleta is declared injured and won’t travel which means Baccari Sagna is set to start at right back position. Leroy Sane, David Silva, Fernandinho, Sterling and De Bruyne to start in 5 man midfield while youngster Iheanacho to start upfront. Hull City on the other hand will keep Diomande upfront with Snodgrass to play in number 10 role. This is how I expect both teams to lineup. Match Predictions: hard to see Hull getting anything out of this game cosidering how Manchester City are playing at the moment. However if Hull can see off the first half without conceding they can get into the game more longer they keep City at the bay. I am going with a comfortable 2-0 win for City in this one.